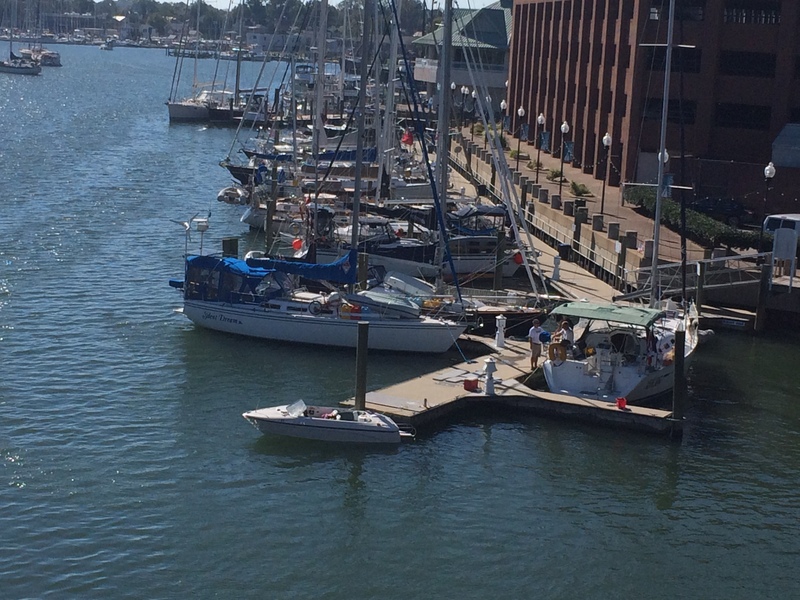 We arrived in Hampton on Sunday afternoon after a great sail! As we hailed the pier to come into dock, we were told to come into slip 19 and someone would be there to help us dock! And of course, the age of question was asked of us – did we want to come in bow or stern first? Well, what idiot thinks we would ever chose stern first? Sure enough, we found slip 19 and there were about 10 people awaiting our arrival. Our boat is 38 feet long and the slips here are barely 20 feet, so needless to say there was a whole lot of commotion at the time of docking. The engine was finally shut off and there was relative calm for about 30 seconds while Brian and I enjoyed the completion of our days sail. But then the real fun began! Brian and I signed up for the Sail Magazine Snowbird Rally to help us navigate our first trip south along the Intercoastal Waterway. Most of our greeters on the dock were from this rally as well. There were a whole lot of introductions being made, the dogs were barking, and within 15 minutes of our arrival, the same routine repeated itself 5 times. It was a docking party! As a tired cruiser, not always the first party you want to go to, but everyone was so positive and nice, it became infectious! Wally Moran, our fearless Rally leader, was docked next to us and his dog, which he rescued from Cuba, wanted to say hello to Phinneus and Pickles. Anyone who has met Phinneus knows he is very social with people but is not the greatest on new canine introductions. Within about 5 minutes of us touching the dog, Phin and Wally’s dog had words, this fur mom had huge guilt, and I realized the next 6 weeks are going to be a bigger challenge as a dog owner than a sailer! 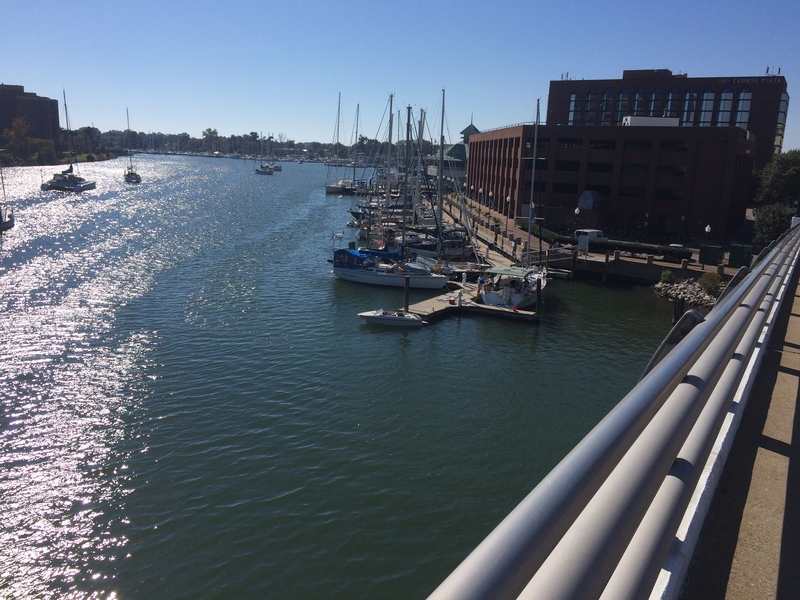 Here is a copy of the blog we appeared in yesterday, and yes, that picture was taken within 5 minutes of docking after an 8 hour sail! We looked great, check out Phin’s curled lip in the picture! Again, another beautiful setting to hang for a week. The atmosphere is fun, there is a wide range of cruisers here, some as new as we are at it, and some who have been out a little longer but still not sure where the wind is going to take us. After talking with some of them we realize we all have the same fears and concerns. It is good to know my doubts are not unique in this group of travelers! Brian spent the day on Monday getting our bikes put together because we are going to be here for almost a week. He set up his bike stand on the dock and worked his magic on the bikes while I cleaned the boat of a very thick coating of salt water. 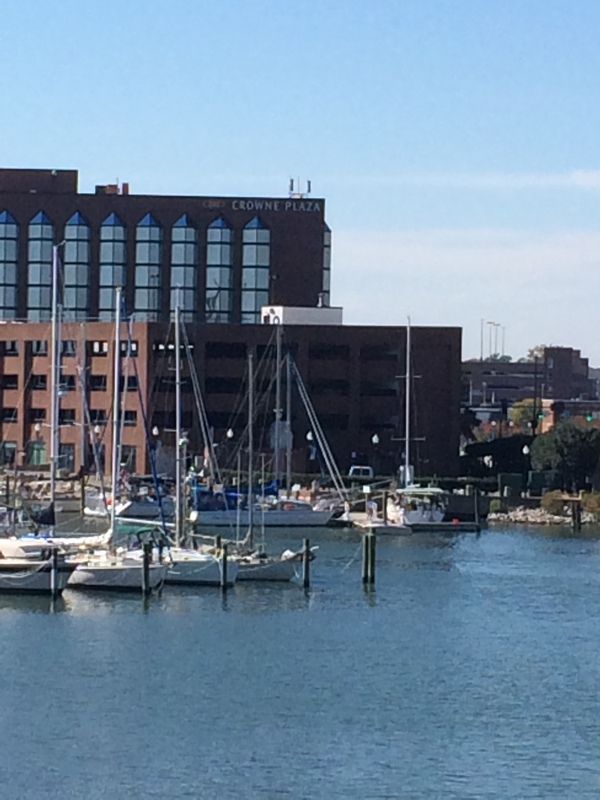 The weather has turned in our favor while we are here, bright sunshine and temps in the 70’s, love it! Once everything was done, I opened up GoogleMaps and found the grocery store and off we went to provision us again. It is easy to stay on a budget when you know whatever you purchase needs to fit in the saddlebags or back pack for the ride home. Brian ended up carrying a box of rice on his handlebars because we misjudged our carrying space, made for some weird looks. Tuesday was a day for chores and then sightseeing. I sanded and varnished the interior wood trim again as well as another coat on the boom crutch (Mike Whitman would be so proud of the job I did). Brian cleaned out the chimney for my cabin heater and fixed a leak we were having in the pressurized water system. As we looked down the dock to the other boats, everyone seemed to have a list of things that needed to be fixed or upgraded, the to do list never gets shorter. Again, we needed to do some sightseeing. 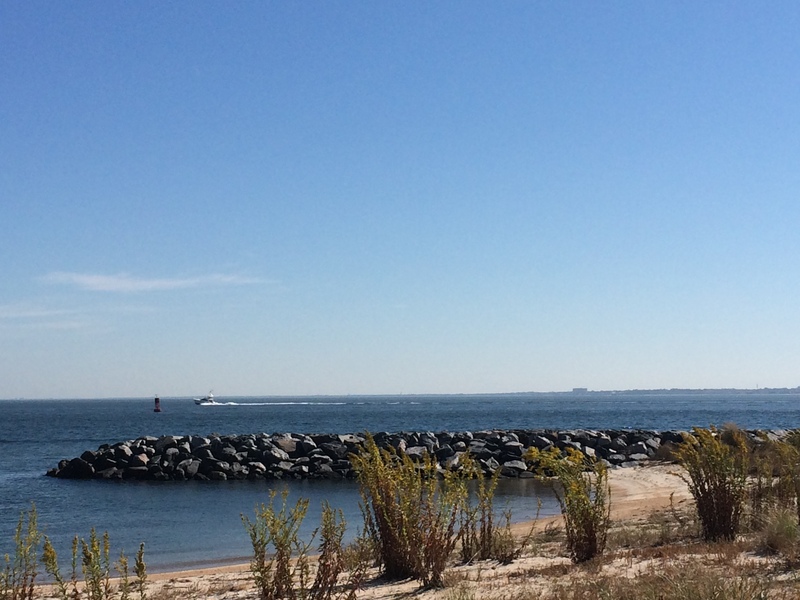 We took off for the afternoon on the bikes to check out Fort Monroe. It was a stronghold during the war of 1812, and was decommissioned in 2011. 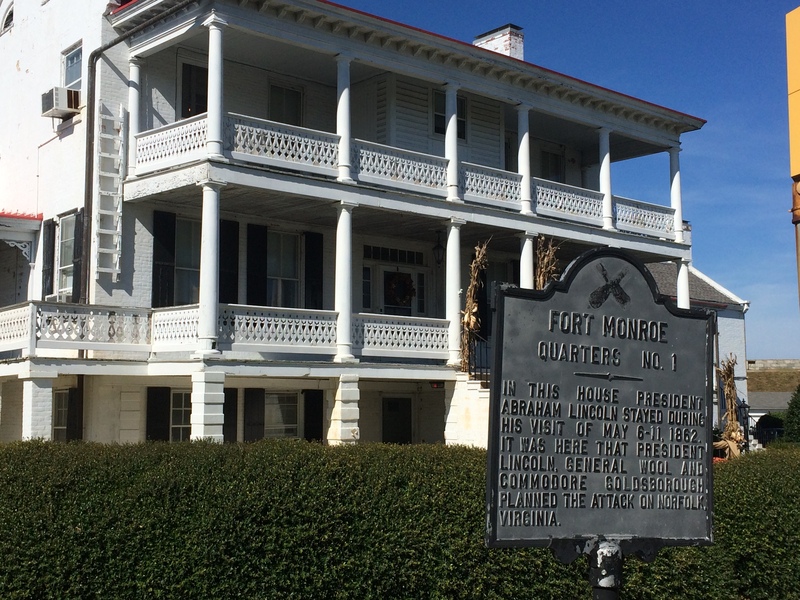 It has a gorgeous perimeter seawall road and there were numerous notable buildings including General Lee’s headquarters. 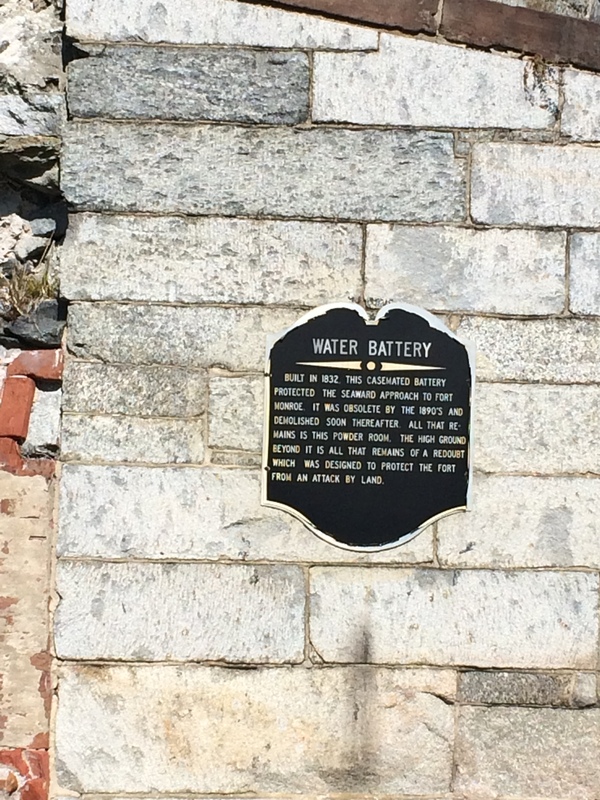 This fort also has a watery battery, better known to me as a mote. Sometimes it is amazing how lucky we are to have history around us all of the time, it is a little creepy at some points of the fort because it is abandoned and if you take a minute to dream about who stood there before you, it can be overwhelming. 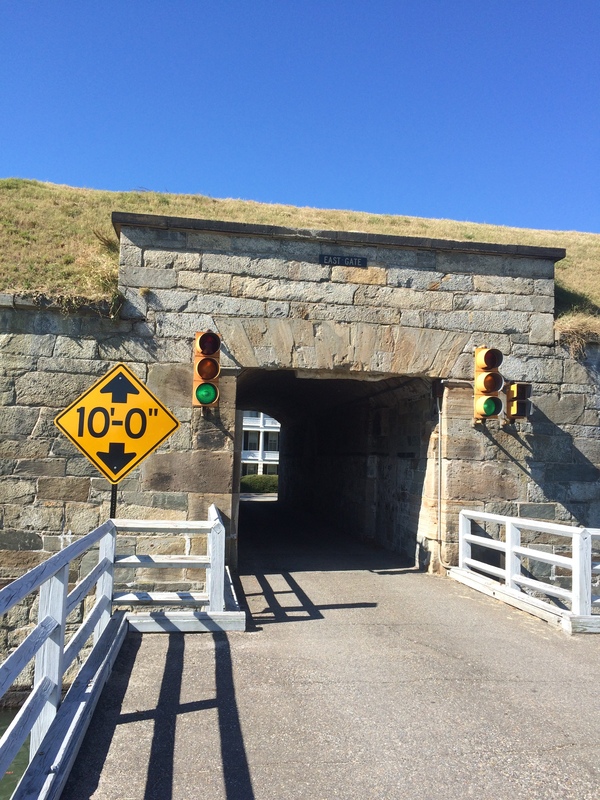 Fort Monroe’s East Gate, not an easy for to get access to the interior. I am sitting at the dinette as I write this with another day ahead of us, looks like a bike ride to West Marine and maybe the grocery store again. I did find a Cold Stone Creamery along the way on GoogleMaps, let us hope it is not wrong. I’m sorry to laugh at Phin but the look is priceless! so glad things are going well, keep the pictures coming, love seeing them! Sounds like you guys have a great plan joining Snowbirds, as I said I know someone just starting out, he got to City Island last night, already having issues, plus the first night he got soaked, NO DODGER, plus he’s alone, I think he’s in for a rough ride. Am really enjoying following your trip. Happy sails!